Terry and Gloria Dilley volunteered with Arctic Barnabas Ministries during the summer of 2008 and joined ABM as associate staff members later that fall. Terry serves on the leadership team, counsels, maintains aircraft, and flies his RV7 to remote villages to encourage, counsel and assess needs. Gloria’s gifting to administrate activities, plan and serve both the staff and at Ministry Family Retreats makes her an invaluable member of the team. Terry, a retired psychologist, commercial pilot and A & P mechanic, grew up in Missouri. He obtained a BA in Math, and the army commissioned him second lieutenant and artillery officer. His flight training in the Middle Tennessee State College ROTC program sparked a life-long love for flying, even though his military flying career ended abruptly after a flight physical. He returned to school for a teaching certificate and a Master’s degree in counseling. He taught and became a school counselor a couple of years before his return to the University of Missouri for a Ph.D. in Counseling Psychology. He directed the Counseling and Testing center at North Texas State U. from ‘71 until ’76 when the state of Alaska designated him as Personnel Psychologist to develop nondiscriminatory tests for hiring and promoting state troopers. In ‘83 he entered private practice as a psychologist in Juneau and to several smaller communities in SE Alaska where he spent a great deal of time in villages and experienced first-hand awareness of the struggles and joys of Christian workers in remote areas. Terry accepted Jesus Christ as his personal Savior while a young teen. He took all the Bible classes offered during his early college years, was ordained a Baptist deacon and served in many teaching, administrative, financial and board positions. He remained a member of Auke Bay Bible Church in Juneau for twenty-seven years. Gloria grew up in South Dakota and trained for a year in Minneapolis to work for the airlines. She worked for Delta in Chicago for six years. In the early 70’s Gloria spent four years with Alaska Airlines in Sitka, married, moved to Juneau and worked for Wien Airlines. Although raised in the church, Gloria came to a saving knowledge of Christ through the ministry of Moody Broadcasting and Bible study with a group of Christians in Juneau. Terry and Gloria married on January 26, 2001, in Auke Bay Bible Church and remained active, Terry as assistant treasurer, Gloria as director of women’s ministry. In late 2006, Terry attended Cochise College in Douglas, AZ to obtain an aircraft mechanic license. They arrived in Kenai in May 2008 to work with ABM, and Gloria found work in the Office of Children’s Services for the State of Alaska until her retirement in 2016. Through previous marriages, Terry and Glory share four married children and 6 grandchildren. 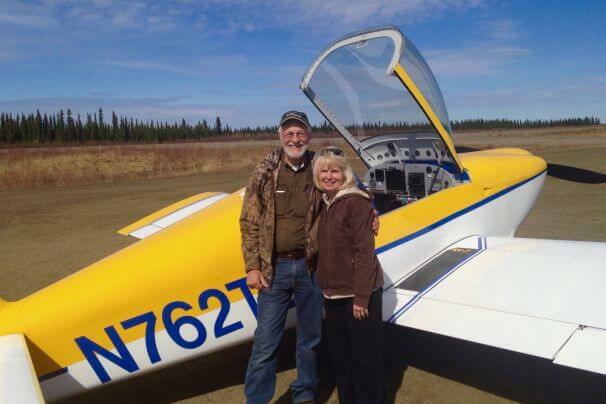 The Dilleys reside in Nikiski, Alaska, live in a hangar house and consider themselves blessed to serve and support those who share the good news of Jesus in the Alaskan Bush.